Stroke of Genius is a microgame found in WarioWare: Touched! in the Slightly Unscrewed stage and returns in WarioWare Gold as one of Young Cricket and Master Mantis' microgames. The objective is to make the swimmer to swim to the very end of the pool and come in first place. The swimmer occasionally swims with different strokes. This game has double the time to complete than other microgames. In the WarioWare Gold versions, there are no opponents, and the swimmer's starting position differs between difficulties. Sometimes the player will have to make a hamster in a ball make it to the end of the pool. 1st level difficulty: The swimmer doesn't need to bypass another swimmer. 2nd level difficulty: One swimmer is in the lead. 3rd level difficulty: The swimmer must bypass several swimmers who swim fast. 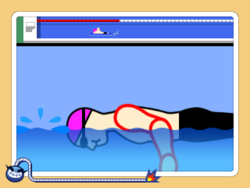 1st level difficulty: The swimmer starts at around 3/4 away from the goal. 2nd level difficulty: The swimmer starts at the far end from the goal. 3rd level difficulty: The swimmer starts at around 3/4 away from the goal, with a shark chasing the swimmer. The shark gradually speeds up as it reaches closer to the goal. If the shark catches up to him, the player loses. This page was last edited on September 24, 2018, at 22:02.